Before another fine WNBA game nearly a month ago, I was eating ice cream with my competition. Tom Smart, a photographer for the Deseret News, was sitting with me wearing his usual smile as our conversation hit on all topics, sacred and profane. If you've covered a big story in Salt Lake City in the past twenty-five years, you know Tom. He's one of those guys who everyone knows. Tom Smart tells the media that the Smart family believes Elizabeth is still alive, June 9. After putting in a couple decades as the News' chief photographer, Tom recently stepped away from his management role and was back to shooting for the paper full-time. Once he made the switch you'd see him show up to an assignment floating on air, so happy to be "just a photographer." This night was no different in that respect. During a timeout we joked about the lighting situation- after a dark, smoky, laser-beam team introduction, someone had forgotten to turn all of the lights back on and the Delta Center was darker than your worst high school gymnasium nightmare. Rather than letting it get to us, we laughed about it. The light sucked, but life was good, and that's the way things were. Later that night, hours after we had packed up our laptops and Salt Lake City fell asleep, a 9-year-old opened her eyes to find a stranger in her bedroom speaking quietly to her sister. He was carrying a gun. The little one feigned sleep, and was the only witness to her sister's kidnapping. These were Tom Smart's nieces, and his life would be forever changed. Fourteen-year-old Elizabeth Smart was gone. As the sun rose over the mountains that morning, the kidnapping was already a huge story. At the family's first press conference, I noticed Tom walking by and shook his hand as he passed. His eyes were empty, but he never stopped moving, handing out fliers and press releases. During the press conference, he stood off to the side with his crying daughters. Tom held back his own tears as his brother, Ed, broke down on camera addressing the kidnapper: "If you can hear me, Elizabeth is the sweetest girl. She's an angel. Please let her go." It was a terrible moment. Seemingly present at every press conference and police briefing, Tom became a man with a mission. He arranged pool situations, answered questions, and was interviewed by countless media outlets. He went for days without sleep. Finding his niece became an all-consuming passion and he devoted himself to spreading the word, getting photographs out, and making sure people were getting information. "I feel that everything I've learned in life was for this," Tom told me on the fourth day after Elizabeth disappeared. I would speak with him a few times over the next three weeks. Sometimes he sounded exhausted. Other times, emotionally overwhelmed. But always positive that his niece would not only be found, but found alive. The kidnapping quickly became a national story. But for the local photographers, it was something more. Rushing to the neighborhood that first morning, they felt more than the usual emotions that come with reporting these kinds of tragedies. These weren't tear-streaked strangers easily framed into clean, contest-winning compositions. These were people we knew, and in some cases, close friends. Even if I'd stayed in college, this wasn't a situation I would have learned about in a classroom. I remember walking up to the family's press conference that first afternoon. 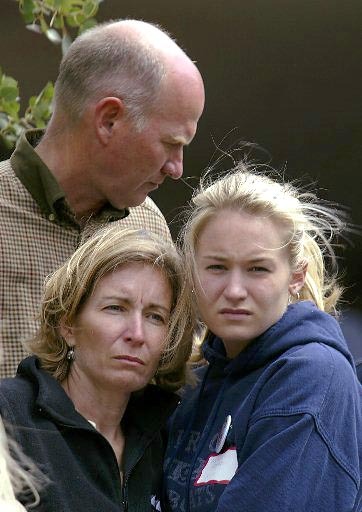 Heidi Smart, left, her husband Tom, top, and their daughter Sierra, right, the aunt, uncle, and cousin to kidnapped 14-year-old Elizabeth Smart, listen during a news briefing Sunday, June 9, 2002, in Salt Lake City. I saw Tom's wife, Heidi. I had seen her many times before, when she photographed University of Utah football and basketball games with Tom. Working as a tech during the Olympics, she was the one who had famously smuggled sushi through the draconian security checkpoints so that the Reuters photographers could have something other than hot dogs to eat. Now she was moving to hug one of her nieces, tears in her eyes. I composed the shot, and realized how strange it felt to photograph someone I knew in this situation, and I think she felt it, too. She seemed to back away from the hug and the moment never materialized. One photographer, who had photographed Elizabeth a few months before, handed out color prints to any media outlet that wanted it, before and after shooting the first press conference. One photographer embraced tearful family members after photographing them grieving. One photographer, a long-time friend of Tom and his family, was so concerned that he'd infringe on the friendship he basically pulled himself off the story. One photographer recalls missing great shots of Elizabeth's parents because two other shooters were working up close with wide-angle lenses and she felt uncomfortable about being so intrusive. Another photographer, as a family press conference was about to begin said, "I hope Tom's not speaking today. I don't feel like taking any more sad pictures of him." The pressure on us mounted during one point it was reported that the police had starting investigating the extended family and Tom admitted to haven taken a polygraph test. Media outlets eager to scoop their competitors started throwing Tom's name around as a possible suspect. Phone calls started pouring into our photo department from various agencies wanting us to send them photographs of our friend Tom Smart, now an alleged suspect. Thankfully by the next day the investigation looked away from the family and seemed to move onto other suspects. But for those hours, things were nuts. Each photographer who heard the news, who had worked side-by-side with Tom for years, took in this twist in the investigation with shock and disbelief. Now it's been three weeks. The emotions aren't as raw, and neither Salt Lake paper is covering the case photographically on a daily basis. The investigation has taken its twists and turns, each day seeming to bring a new development, but Elizabeth is still gone. One night during the first week there was a candlelight vigil in Liberty Park. There was a prayer, a moment of silence, and candles were lit. I photographed the sad family and stood there in the cold, feeling the grief and watching. Tom was one of the last people to leave. He embraced me, and with tears in his eyes, said, "You know, I'm a crazy guy. But I know she's coming home."